It is sometimes surprising what goes through the mind of an alcoholic when asked what that power greater than ourselves is all about. Commonly, they might say something like “God” or give that greater power a religious connotation, but that power that so drives and motivates an alcoholic to want to stop drinking can be something very different. For Brad it was the birth of his little baby girl. He knows he has a problem! A lot of people talk a good game and tell you that they will stop drinking or that they will “cut back” or they will otherwise get their life under control. But Brad knew he had a serious problem, knew he wasn’t going to just stop drinking, and took steps to turn his life around. It began in prison, where he was serving a short stretch for drunk driving, after several previous convictions and fines. While incarcerated he began to come to grips with his disease and his responsibility in treating it and taking positive action. Maybe God is trying to show me something? By the time he was released, he had been diligently working on his steps for six months and got out just in time to participate in the birth of his child. “Man that was awesome,” he said shortly after her birth. The power greater than ourselves is often found in relationships. If a person can break outside of self and focus on another individual or a task, it is harder for the disease to completely control their behavior. Self-focus is surely a recipe for more drinking, as we fixate on our own issues, our problems, our concerns and we numb the pain with alcohol. Brad had always taken the inside route in life, worrying only about himself and what he was doing. He was so excited about being a father, so his days in lockup were useful in preparing him for accepting the responsibility that comes with parenthood. He wanted to be at the birth. He wanted to be with his girlfriend. And now he is talking about wanting to get married and having a family. 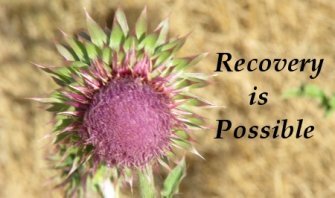 Could implies that it is possible, but also means that if we do not allow the process to take place, or if we are not diligent about taking care of business, relapse is possible. Something more powerful than me has to be in motion to get me out of this mess. Brad seems to think that God has used the birth of his daughter to help him realize he needs help. That is a beginning. Brad said he is just now beginning to realize that relationships play a huge part in getting his life back. His girlfriend talked of his alcoholism and recovery process prior to giving birth. She was pleased with his efforts and determination, but also cautious about not declaring success too soon. She believes he wants to quit! Brad is on the beginning path of a long journey to sobriety, responsibility and family life. The power greater than Brad just might be a little 8-pount package delivered shortly before this story was composed. To be continued as brad makes his choices.